With Black men rejecting religion and the commitments of marriage and family, why the interest in and push for polygynous marriages? Black men across the country repeatedly state that monogamy is counter to their nature and that through marriage, women attempt to control male sexuality. Other men say that polygamous unions would be a way to resolve the issue of high rate of single black women in the U.S., and to ensure that children have fathers around. Surprisingly, there are growing numbers of Black women that agree with this position, and believe that polygamous marriages should be made legal. 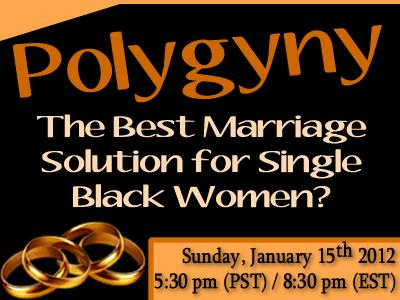 Is polygyny a viable option for black families and single black women, or is it nothing but a new game to pimp women and the latest booty hustle? Share your opinions by calling 347-327-9215.